Periodontal disease is the medical term for what is commonly called “gum disease.” Gum disease affects millions of people each year, and is one of the most preventable causes of tooth loss. Fortunately, there are effective treatments for periodontal disease, and the earlier it is found, the more effective these treatments are. There are several procedures which come under the heading of periodontal treatment, but for the most part they can be divided into two categories: non-surgical and surgical procedures. Non-surgical procedures are appropriate when periodontal disease is not well-advanced, but more serious cases of gum disease may require surgical remedies. Non-surgical periodontal treatments include root scaling and planing. This is a relatively simple procedure in which the roots of the teeth are deeply cleaned below the gumline, removing dangerous plaque and tartar which have built up under the gums and may cause pockets of decay. Root planing and scaling are very effective at removing decay and plaque buildup in the early stages of gum disease, and can often reverse the effects of periodontal disease. If gum disease has progressed beyond the early stages, more serious measures may be necessary. One type of periodontal treatment which may halt the effects of more advanced gum disease is pocket reduction surgery. In this procedure, the gum tissue is folded back to allow the dentist to reach pockets of decay or bacteria under the gumline. The area is thoroughly cleaned and the gum tissue is replaced and anchored into place to prevent further infection. The tooth enamel beneath the gumline may also be polished to deter bacterial growth. Whether you need surgical or non-surgical periodontal treatment often depends on how quickly your gum disease is discovered. The sooner you begin periodontal procedures, the more likely those procedures are to be successful, and the less invasive they tend to be. Dr. Bijan Afar, West Hollywood dentist, can examine your mouth for gum disease and determine the most appropriate way to fight problems found which may jeopardize your oral and overall health. Dr. Afar, a board-certified periodontist can explain the purpose of various periodontal procedures, and will discuss your medical history to be sure that surgical measures are appropriate if they are necessary. 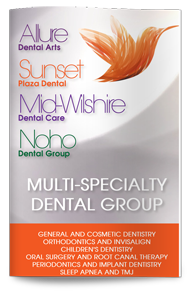 Visit Dr. Afar, dentist in West Hollywood, as soon as possible to discuss your periodontal disease issues. Do not wait—the sooner you visit our office, the sooner you can be on your way to good periodontic health.